If you’re ready to escape the overwhelming demands of day to day life, and reconnect with the people and things that matter most, Newell Lodge and Resort at the Okefenokee Swamp is the right place for you. You’ll “Vacation in Rustic Style” at Newell Lodge, where you have the rare opportunity to slow down the pace of life so you can focus on what really matters. 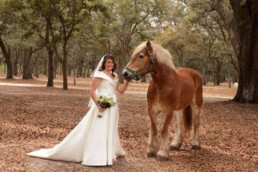 The region’s premier family vacation resort and dude ranch, Newell Lodge also hosts rustic weddings, reservation-only outdoor events, and private retreats. Owned by the Harvin Carter family and operated by Kay Carter, the lodge is today a favored Southern hospitality destination for multigenerational horse and rustic living enthusiasts who want a memorable Okefenokee experience. Why not dwell in this magical land of fireflies and water lilies with the people you love most? 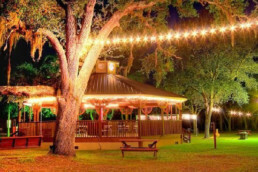 Newell Lodge is framed by an expansive, natural oak grove setting that is both picturesque and relaxing, a perfect backdrop for timeless photographs and effortless family fun. While here, you’ll find yourself in the middle of nowhere and at the center of every advantage the region has to offer. You will enjoy all the advantages of a “staycation” in your fully outfitted home away from home. Everyday activities here may include board games after dinner, an afternoon carriage ride and picnic, settling down with a book, journal or paints, grilling today’s catch, morning yoga, exploring nature trails with the family dog or adventuring on horseback. We invite you to indulge in a range of adventures great and small. Spend a lazy day in a hammock. Take bicycle rides down sandy lands. Hoof it across private forest reserves. Watch trains with enthusiasts from near and far. Explore colonial era forts, lighthouses, or the region’s hard-to-find plantations. Spend a day exploring small town antiqueries or Savannah’s exquisite boutiques, ramble down Jacksonville’s River Walk, go beachcombing on Jekyll Island, or explore the nearby Land of the Trembling Earth, and more. Whether you choose from a range of adventures, or stay right here, we go out of our way to ensure every minute is quality time. If you want to create once in a lifetime memories that stand the test of time, we think you’ll love it here.